Garage: "Garage: 2 Car Attached; Parking Space(s): 5"
Lot Size: 5452sq. ft. 58ft x 109ft "Corner"
Attractive Assumable Mortgage on this Excellent Silverwood Home, Located Close to the River! \r\nA spacious floor plan with 1192 sq ft, four bedrooms, three bathrooms, the living room with a fireplace, large windows for lots of natural light and newer laminate flooring. A bright kitchen with lots of updated cabinets, a breakfast bar, pantry and large dining area. A large master bedroom with an ensuite bathroom. The lower level is fully finished with a family room, games area, den, bathroom, laundry and storage. A nice mature yard with a newer fence and newer tiered deck. Double car garage and lots of extras including central air conditioning, central vacuum and all appliances included. 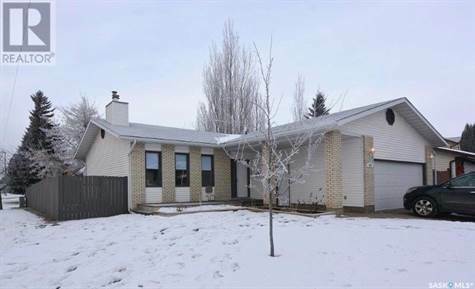 A fantastic crescent, close to Meewasin Trail, the golf course, the new bridge and all conveniences!